Okay, we didn’t actually camp out at the Washington, DC Green Festival (Sep 29-30, 2012), but after two long days immersed (with our three boys) in a fabulous array of green presentations, vendors, films, DIY demonstrations, and discussions, we felt like fixtures. In fact, I was so recognizable carrying our two-year-old on in the Ergo on my back for hours on end that as we were leaving on Sunday evening, one of the Green Festival staff offered the three boys these great organic cotton shirts, joking that they were rewards for my fathering work. We all had a blast while learning a lot, especially our oldest son, who came away inspired to vanquish global warming. This video captures a taste of his enthusiasm. Billed as “the nation’s premiere sustainability event” the Green Festival is held annually in multiple cities across the U.S. and has been around for ten years. The event, co-sponsored by Green America and Global Exchange, is designed as a showcase for thousands of people to explore green solutions and sustainable choices. There’s something for everyone – from long-time sustainability advocates to those new to the idea, looking for ways to make sustainable, healthy choices for themselves and the planet. While the sustainability work I do in my day job at the University of Virginia was the primary impetus to attend, I couldn’t help but approach the Festival wearing multiple hats: including that of a green business owner, a green consumer, and a green educator – always weaving sustainability lessons into my interactions with my own three children. While there are many arguably greener ways to explore the latest and greatest ways to care for Mother Earth, nothing can compare with the impact of in-person, hands-on exposure to green efforts and the people behind them. That’s the success behind this event. Since the Festival is aimed widely at citizens and consumers making green choices, it was quite interesting to see what vendors made an appearance. Ford was the largest underwriter (they are rolling out new lines of hybrid and electric cars), and they had a lavish display of sustainable improvements in their products. There were also manufacturers of electric bikes and scooters, car sharing (Zipcar and a competitor), and more. Green home retrofitting was a big section, as was fashion and pet products (obviously a bigger industry than I tend to realize). Food and all things related was the other biggest section. The Clif Bar booth was one of the most popular — they gave out tons of samples all weekend long! Relay Foods, based right here in Charlottesville was also there. They just acquired Arganica, another online grocery distributor, and thereby opened territories in DC, Northern Virginia, Baltimore, and Philadelphia. We love their service and have been fans of the business model since they opened. One of the best things was just being away and having a weekend full of reminders of the importance of making sustainable choices in our everyday lives. That’s one of the big reasons why we started Tender Sapling: to provide attractive green choices and to help educate kids about our responsibility as stewards of the planet. The big green celebration was also a healthy reminder that while making informed green choices is critical, we won’t have much impact on climate change and all its effects without a much more active involvement from the governments of the world. More on that topic in a future blog post. Most of all, I was startled at the impact it had on our boys, especially our nine-year-old. In hindsight, the experience was almost like an immersion in a foreign language environment, where kids just soak it up and are fluent in no time at all. We’ve discussed climate change and global warming and many sustainability-related topics, but being in a place where everyone was focused on sustainability was a new experience. Our two oldest became engrossed in a short animated film playing in the kids section that was a remarkably thorough introduction to global warming presented by animals and sinister CO2 blobs. They loved it, and it has sparked many interesting discussions. It’s fun seeing how excited Liam is to talk about it. Get a taste of his enthusiasm in this video. Did any of you get to drop in on the DC Green Festival or any of its other stops around the country? What were your impressions? How do you talk about sustainability with your kids? 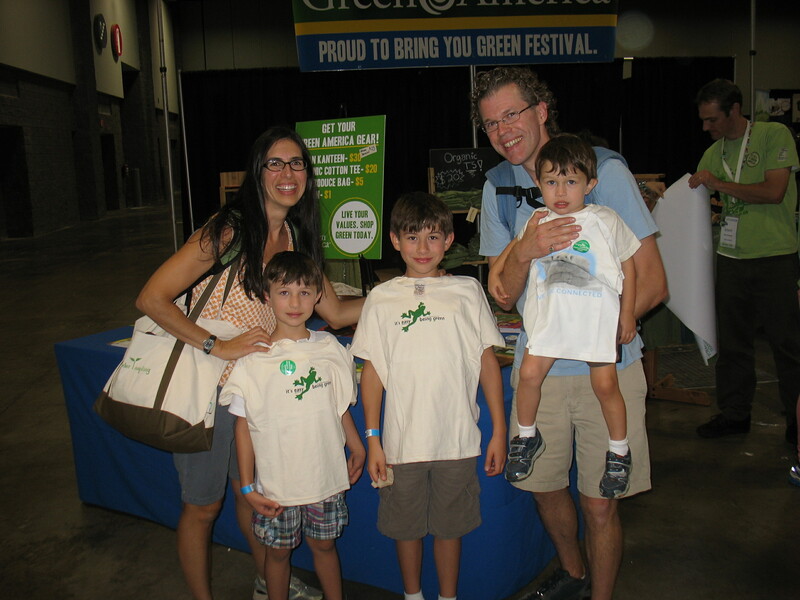 Categories: Have Fun, Sustainability | Tags: climate change, global warming, Green Festival DC, Sustainability | Permalink.